Richard Vis, Senior Learning and Development Executive at Staples Solutions, quickly realized he was not cut out for the life of a programmer. He was more energized by talking about the hardware and working in an interactive environment. 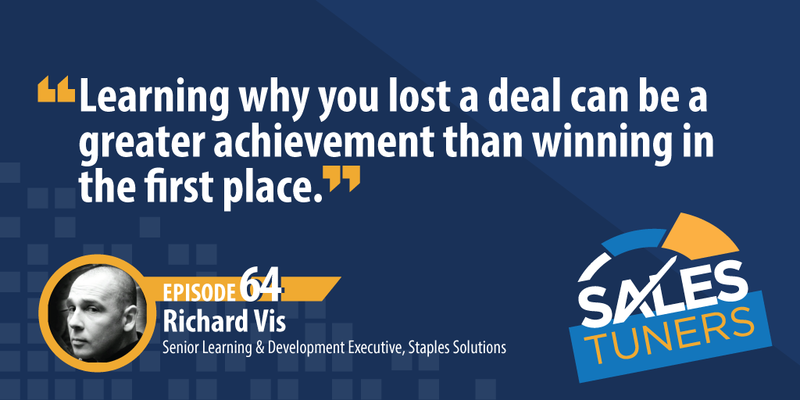 After 23 years in sales, the process training he had as a programmer helped Richard level up in his career by understanding the significance of following a sales process. As someone who now educates and coaches a team, Richard started looking at behavioral style training. He has a natural interest in what makes people tick. So instead of focusing on the negative, he opens up the conversation based on what he sees, seeking to uncover how their actions impact their results. Richard looks to empower his team to help them understand how their behavior creates their prospect’s behavior. In his coaching, Richard talks about the importance of knowing the techniques, but it’s just as important to use your intelligence to make the techniques your own. Attitude is Everything: A trend that I see becoming more and more prevalent every day is new grads thinking they should be able to jump from Sales Development Rep to Chief Revenue Officer. I’ll admit, I too thought I knew everything at 22, and 25, and 30, but the more I learned the more I realized there was to learn. Carrying a learning attitude combined with a personal “why” will help you climb the rungs quickly. Build Your Own Tools: It’s easy to look to your manager or even the company as a whole to provide all the tools you need. Instead, look to them for guidance or a framework and build your own. This forces you to be both adaptable and personally accountable. Knowing something is one thing, but the next step is making it your own. You Create Your Audience: This whole show is about the behaviors, attitudes, and techniques of sales success, and I think Richard summed it up nicely by saying it’s the combination of all three of those things that creates the audience you sell to. The way you ask questions, your ability to read your prospect and put them at ease, whether or not you keep your word, think hard about whether or not you would buy from yourself.